I have this friend named Aurthur, he just turned 8. And because he is so awesome, he deserved a really awesome cake. But cakes take forever. Hours longer than anyone who hasn’t attempted novelty cake making really understands. I don’t really have the 18 plus hours that a really awesome cake takes. But I still wanted to give him a really great cake. So I devised a really easy cake that takes less than 4 hours to make. 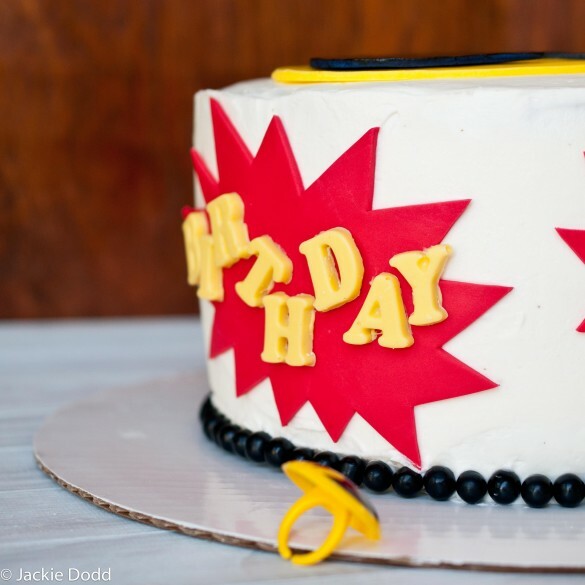 In the world of cake making, that is practically lightning speed. You can add all of the additional details you want, or just leave it super simple. First step, bake the cakes. Let cool completely. Make whatever filling you plan to use. I like the fudge, as listed above, or pastry cream. You will need to ice it twice. 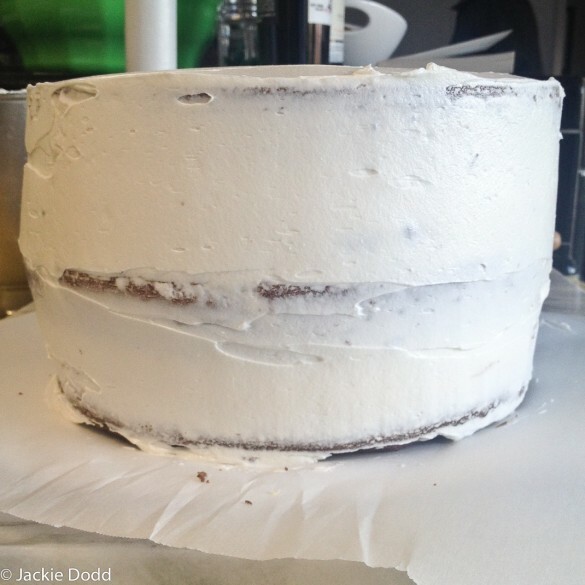 The first ice is called the crumb coat, or the dirty ice because no matter how careful you are, there always seems to be crumbs in the first layer of frosting. Let that chill in the fridge for about 20 minutes or until the frosting has set. 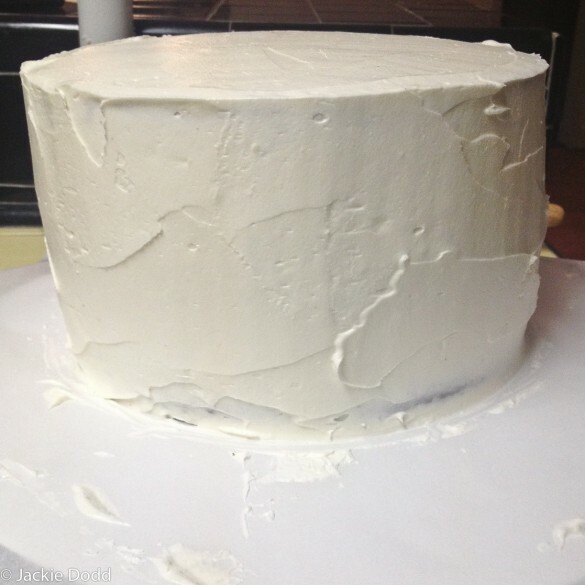 Add another layer of buttercream and try to smooth out all of the bumps as much as you can doesn’t have to be perfect, we will smooth it more later. Chill until the icing has completely set, between 20 minutes and 2 hours. 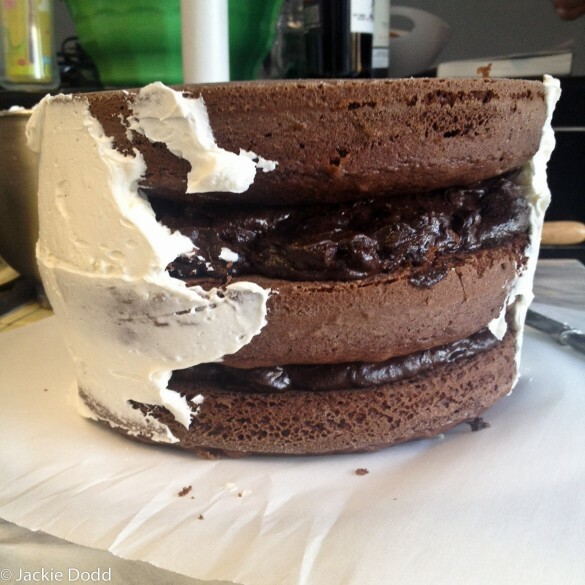 Once that is done, place a viva paper towel, smooth side down, on top of the cake. 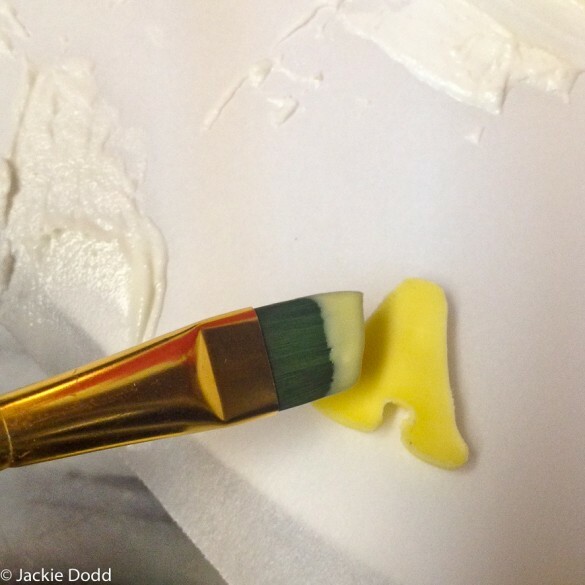 Use a fondant smoother to smooth out the rough edges. 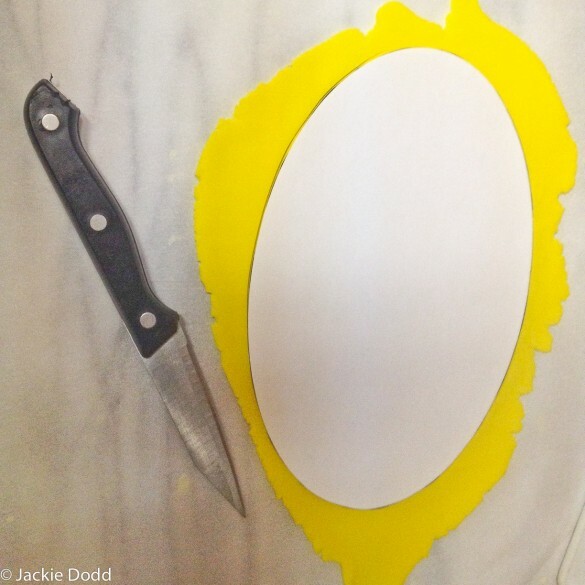 For the fondant shapes you can either color white fondant, use pre-colored or paint a shape once it’s cut out. Pre-colored is obviously easiest, but it can get pricey to buy several colors. To color it yourself, just add a small amount of gel food coloring (liquid food coloring will make the fondant too sticky) and knead until evenly distributed. I’m not a fan of food coloring, but I am also not a fan of fondant, so it isn’t an issue, I just don’t eat it either way. Roll out a golf ball size chunk of fondant. I decided to paint this one black to give it shiny apperance. I used blue fondant that I already had. Print out this: Batman logo, cut carefully around the symbol. 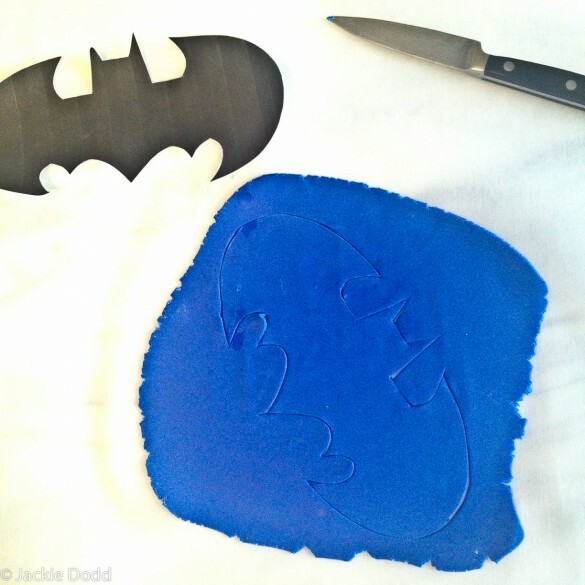 Place fondant on a sheet of parchment paper, place batman symbol on top of the flat fondant. Use a sharp paring knife to cut around the edges. Paint black, if necessary. Allow to dry and harden a bit, about 15 minutes. Roll out a golf ball sized piece of yellow fondant. 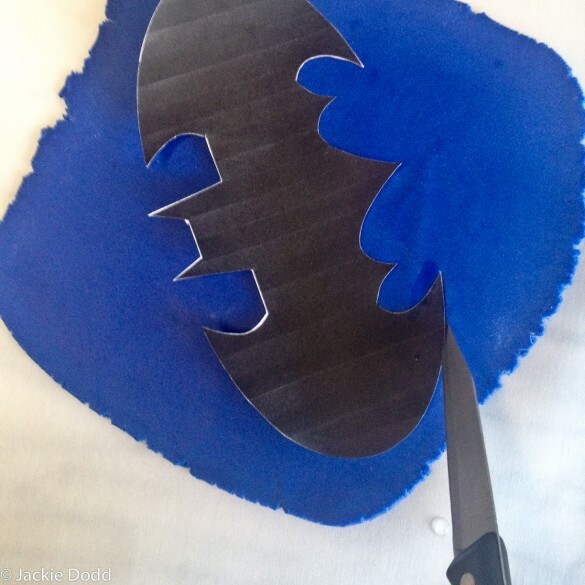 Cut out Batman Background, cut around the edges and lay background on the yellow fondant. Cut around the edges with a sharp paring knife. 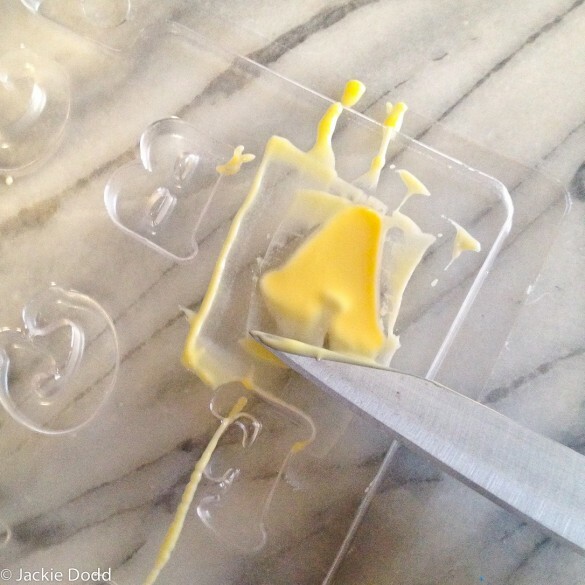 Using your fingers, moisten the top of the yellow fondant slightly with water. 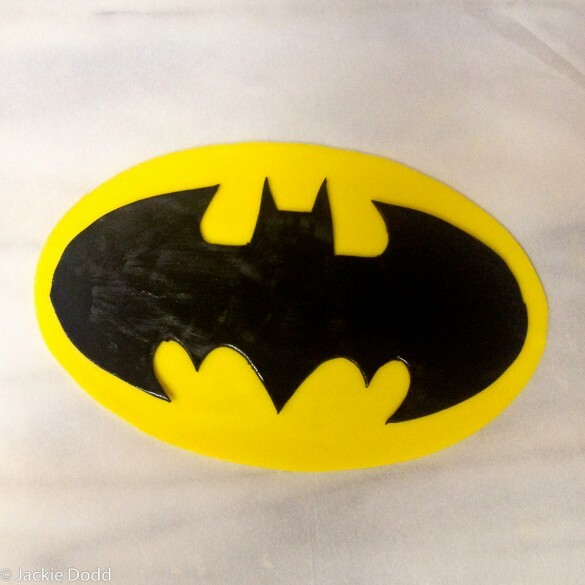 Transfer the black Batman Logo to the yellow background. Roll out a piece of red fondant. Cut out the Callouts and place on the fondant. 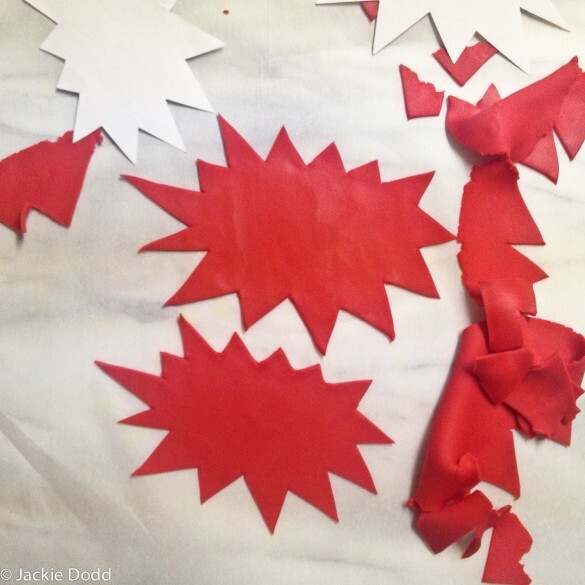 Use a knife to cut out the shapes. Add about 1/2 a cup of yellow candy melts to a microwave safe bowl. Microwave on high for about 30 seconds, stir and repeat until melted. Add to the alphabet molds, scrape off the excess with t he back of a knife. Chill in the fridge until set, about 5 minutes. Remove from mold. Add the shapes to the cake, pressing into the buttercream. Brush a bit of melted candy melts (re-melt in the microwave if necessary) onto the back of the letters. Press them into the callouts. Use the black ball candies to form a border around the bottom of the cake. Absolutely brilliant!!!!!!! I have a granddaughter who will 6 this coming Friday and who is crazy about Batman. A real tomboy unlike her 4 year old sister who likes dolls. I’m afraid Eden follows her grandmother! Ha Ha. I’m going to make this cake for her. Yeah that’s effing awesome. Can you make me a birthday cake? So cool! I love working with fondant. I have my share of girly cakes but this one makes me excited for my son’s birthday! This is so much fun! Nicely done! Dang, is there anything you CAN’T do? Such a cool cake! Aww, you’re so sweet. This is actually really easy. Girl, you are crazy talented. This is amazing! Good job. Thank you for doing such a good job with the cake tutorial. I think it makes alot of sens. Hi! I’ve never made a really fancy cake before. just sheetcakes lol. 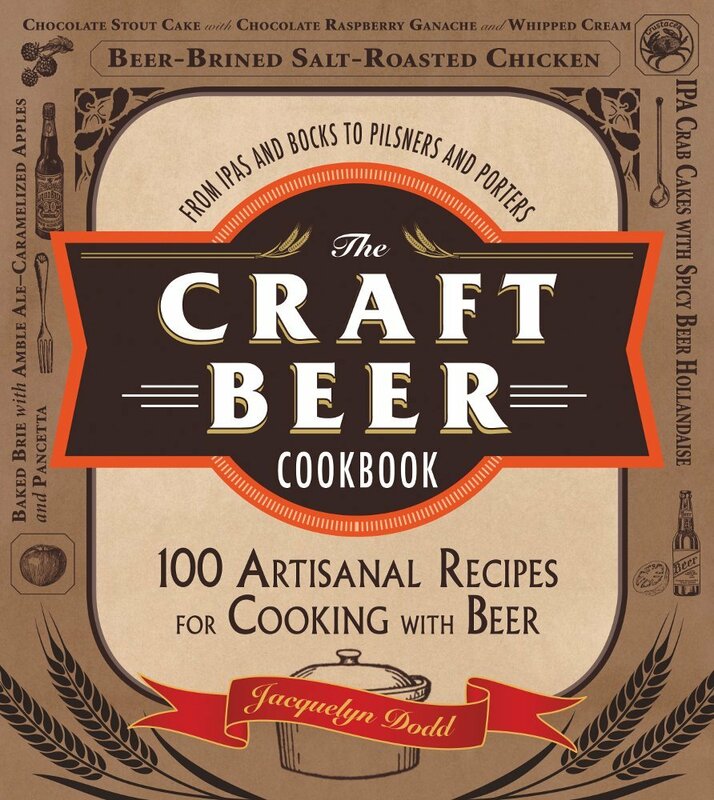 but I think i could make this! It isn’t too difficult. I think you can do it. Exactly what i wanted for my sons bday. thank you!!!! Great! Have fun. Let me know how it goes! Awwww, Jackie, this is just too cute! You totally outdone yourself here! Great. Thank a lot for posting this, I was looking for a cake to make soon, to try it out. this looks great. This is seriously SO cool! I love this! I wanted to make a cake for my nephew, and was scared. This doesn’t look too hard at all. Arthur is one lucky guy with an awesomely cool cake. What a great tutorial for a super pro result! Oh my! Happy Birthday indeed! This is so impressive! You are so talented, J! You make it look so easy!! My middle son’s 4th bday is coming up and he is batty for batman. I like that you made it so easy. I’ve never made a fancy cake, but this seems do able. 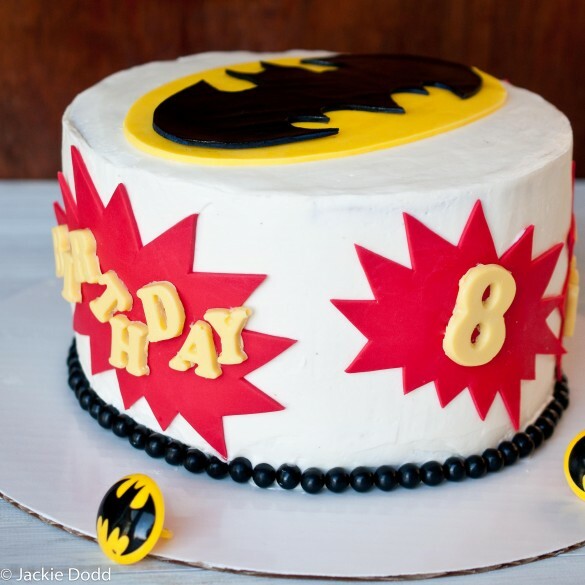 I really want to make this cake next week for this huge Batman fan i know but im having trouble finding the lalphabet mold. Do you have any ideas? If you live by a craft store, that might be the best route. I think Michael’s Arts and Crafts or Hobby Lobby might carry them. Also, try cake or candy supply stores. Call around to save yourself the drive! 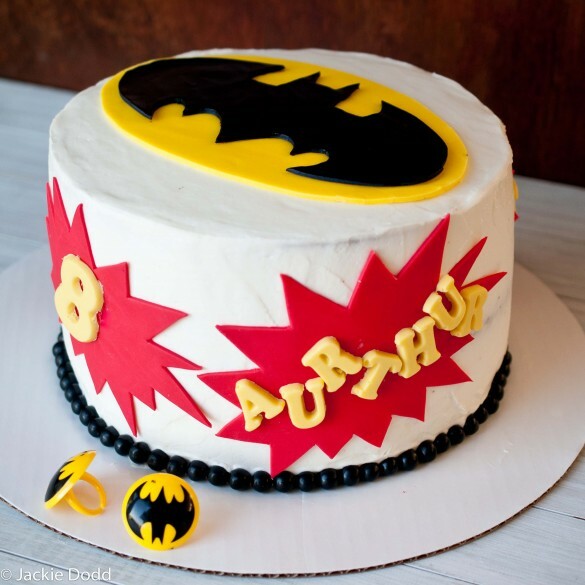 You can also print letters on paper, cut them out and use them like the batman logo as templates to cut the words out of fondant. But that takes longer, but you can do it up to 3 days in advance. This is fabulous. My son has recently become a Batman fan and I think it would be ideal for his forthcoming 4th birthday. Thanks for the tips- i just need to find somewhere that stocks candy melts here in Ireland! Thanks so much for posting this. I volunteered to make a cake for a friend’s son- and he wanted the batman symbol. I pretty much followed your recipe and today he declared his cake the “best ever”. It was so nice to make him happy! Great pictures, and easy to follow- thanks muchly! Perfect ! I tried doing the symbol free hand, not good. Thanks for the template. 9 inch, but I’m sure 8 inch would be fine as well. Thanks for the templates I am using them to make a quilt. Thank you for this! 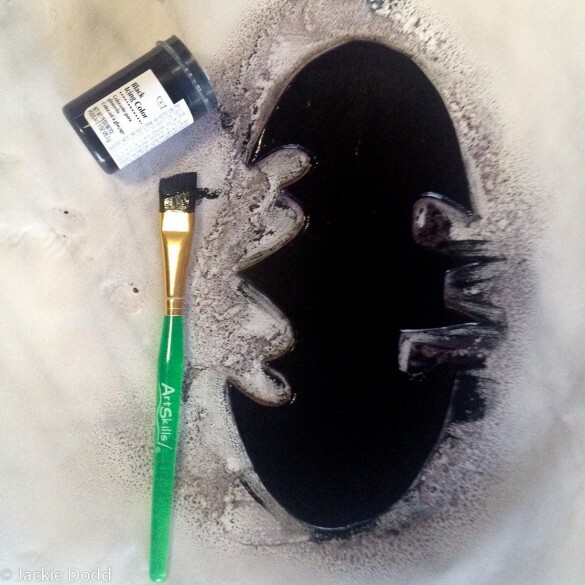 I’ve a batman cake to do this week and the templates will really save me a job! Thanks! 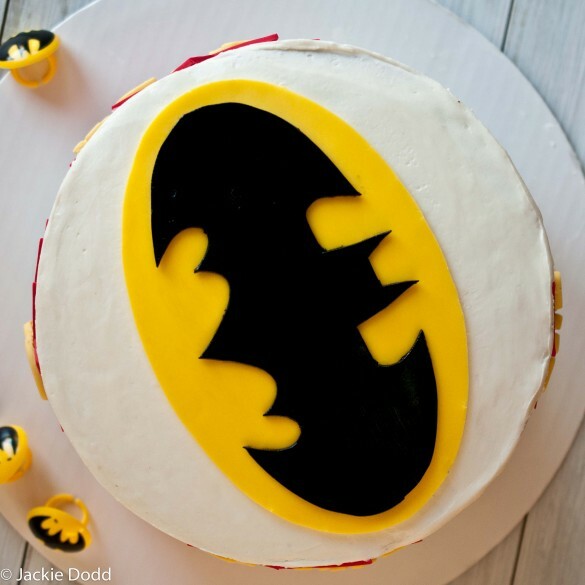 I stumbled across this while looking for a last-minute batman cake idea. It’s perfect for my friend’s 3-yr old batman fan. I had to laugh about the time comment you made- character cakes really do take a long time! Thanks so much for the inspiration and the template, this is great. Thanks for the template – I really like this shape of the Batman symbol. I’m making a cake for my 3yos party this week. I am actually hoping to trace this with frosting and freeze for my cake topper rather than use fondant — I prefer taste of frosting than fondant, that’s all 🙂 Cheers! Hi Mal – how did it turn out with the frosting? I’m thinking about doing it that way too…any tips and pics? So I made your cake today but omitted the filling because it didn’t come out right. I had to a little change seeing that I didn’t use chocolate and mold for lettering but it all came out great! Especially since it’s my first time stacking a cake, frosting and using fondant! Thanks so much for your easy instructions! I made this for my daughter’s 30th birthday.. total awesome cake. Thank you!! 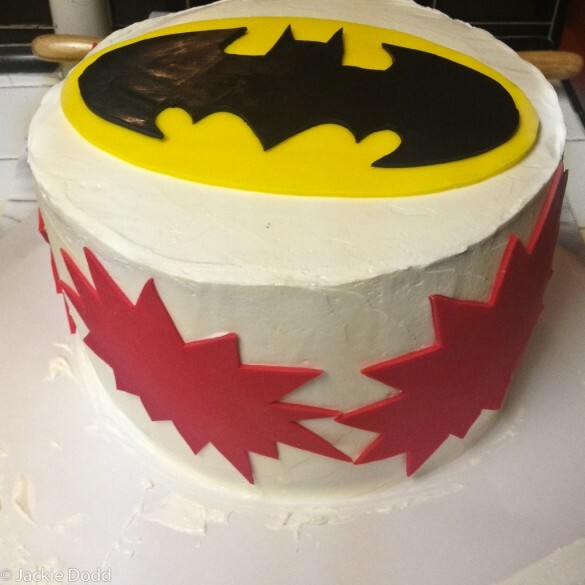 Hi i so glad i went on pinterest today as this came up as i was looking for ideals to make a batman cake for my daughter 16th on boxing day who crazy over batman ! your cake looks fabulous ! so i gonna try make one once i got all the ingredients this week and make it b4 kids breaks up for xmas ! Thanks will have a go for my daughters 16 birthday…it looks great !